Please slow down in the No Wake Zone! 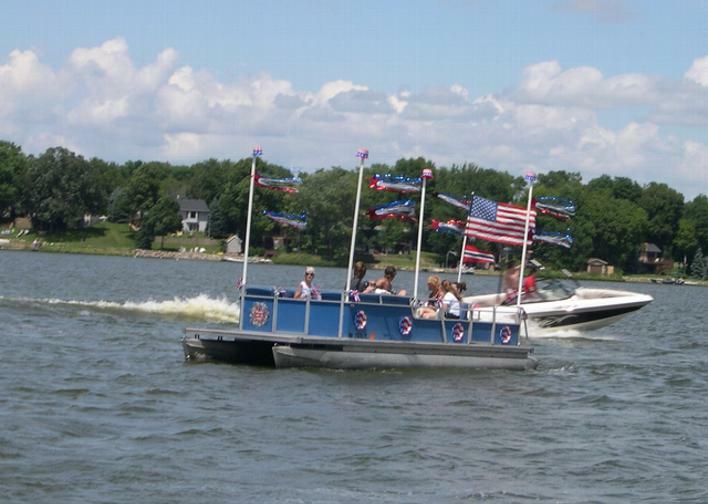 As a reminder to boaters, the ordinance providing for enforcement of the Slow No-Wake zone in the mid lake channel defines slow no-wake as "operation of a watercraft at the slowest possible speed necessary to maintain steerage, but in no case greater than five miles per hour." (MN Statute 56B.005 Subd. 16a). The Hennepin County Sheriff Water Patrol adds "producing no white rolling wake anywhere from bow to stern" as their practical definition. Interestingly enough, the sheriffs dept. notes that most of the offenders are actually lake residents, not visitors! The no wake zones were created to help to reduce shoreline erosion and property damage in constricted areas as well as promoting safety in the narrow mid-lake channel where boats may be in close proximity to shorelines and each other. Lets see if we can improve compliance without having to have the Sheriff writing tickets. To view the ordinance please see Section 1 (Independence city code 915.05.). 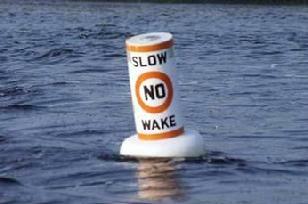 Slow no-wake zone on Lake Sarah. Subd. 1. No Wake in Channel on the No-wake Ordinance page. or on the city of Independence website. Courtesy and Situational Awareness when operating watercraft are helpful in the effort to prevent accidents and promote a more enjoyable use of our shared resource. Conflicting uses often present situations where common sense and good judgment will go a long way toward avoiding problems and confrontations. Obey the laws, respect others rights, and practice safe boating etiquette and we can all enjoy the lake together. For engines 25 horsepower or less, those under 12 years old may operate with no restrictions. For engines more than 25 horsepower through 75 horsepower, those under 12 years old must have someone at least 21 years of age on board who is within reach of the controls. For engines over 75 horsepower, no one younger than 12 may operate, even with an adult on board. Someone at least 21 years old on board who is within reach of the controls. Operators visiting Minnesota, who already possess a valid watercraft operator’s certificate or permit issued by their home state, don’t need to obtain another one from Minnesota. You must be 13 years of age or older to operate a personal watercraft on Minnesota’s public waters. A watercraft operator’s permit and be under continuous observation by someone at least 21 years old. Boat Minnesota is the official online boating safety course developed by Boat Ed for the Minnesota Department of Natural Resources. Taking this safe boating course will allow you to get your Minnesota boating license online. If you are 12-17 years old, you will receive your official Minnesota Department of Natural Resources Watercraft Operator's Permit. If you are 18 or older, you will receive an official Minnesota Boater Education Certificate. Adult students are not required to have a Watercraft Operator's Permit, but may use their Minnesota Boater Education Certificate as proof of passing this course. Step 1 - Study the Minnesota safe boating course material and pass the Minnesota Boater Safety Course exam free of charge (if you don't pass on the first try don't worry. Keep taking the exam for free until you pass). Step 2 - To receive your Minnesota Watercraft Operator's Permit (12-17 year olds) or Minnesota Boater Education Certificate (for those 18 or older), after passing the exam pay the $20 fee, (collected online) and print your temporary certificate. Your lifetime Boater Education Card will arrive by mail in 2-3 weeks. You must be at least 12 years of age to take the online boating test. When you pass the exam, you can immediately print out a temporary Minnesota Watercraft Operator's Permit (for those 12-17 years old) or Minnesota Boater Education Certificate (for those 18 or older) while online. Your permanent Minnesota Watercraft Operator's Permit or Boater Education Certificate will be mailed to you by the Minnesota Department of Natural Resources within 2-3 weeks. Passing the Minnesota boating safety course may make you eligible for a discount on your boat or PWC insurance. Send a copy of your boater safety certificate to your agent and start saving! You also have the option of taking the Minnesota DNR’s free home study course available by contacting the MN DNR at info@dnr.state.mn.us or 651-296-6157. Minnesota Department of Natural Resources (DNR) conservation officers are not seeing what they would like when it comes to the safety of Minnesota boaters. There seems to be a number of people who don't have the correct number or type of personal flotation devices, commonly called life jackets, life vests or PFDs on board their watercraft. "I regularly see three problems," said Milaca-based DNR Conservation Officer David Schottenbauer. "Folks take the boat out for the first trip of the season and forget the PFDs; they are unaware they need a throwable PFD for boats 16 feet and longer; or they incorrectly assume a boat cushion counts as a primary PFD for a person on a boat." On all boats, except a sailboard, regardless of length (including canoes, kayaks and duck boats) there must be a readily accessible U.S. Coast Guard approved wearable PFD (life jacket) for each person on board. Type IV throwable devices, such as boat cushions, are no longer acceptable primary lifesaving devices. If the boat is 16 feet or longer (except canoes and kayaks), one U.S. Coast Guard approved Type IV throwable flotation device, such as a boat cushion or ring buoy must be immediately available on each boat. In addition to wearable life jackets, a boat cushion or ring buoy has been required on boats 16 feet or longer in Minnesota since 1996. In spite of some adults forgetting about the life jacket laws, officers report children under 10 are doing a great job wearing their life jackets in compliance with the Minnesota law that became effective in 2005. That regulation requires children under 10 wear a life jacket when boating unless on a boat with a licensed captain, or a craft that is anchored and being used as a platform for swimming. The other exception for the child PFD law is if the child is below decks such as in a cabin cruiser. Officers also report that a few parents have been buying nonapproved flotation jackets, suits and swimming aids for their children to wear while boating, but that these do not fulfill legal requirements. The DNR is reminding adults to check the label for U.S. Coast Guard approval before putting it on the child for a day of boating. Children found wearing their life vests while boating are eligible for a PFD Panda certificate handed out by DNR officers and county sheriff's deputies, with an attached coupon good for a free Dairy Queen treat. Violation of any of the life jacket laws can bring fines and fees of more than $100 for each occurrence. Got questions about Minnesota Water Laws? What is a floodplain? Who owns the lakebed? What is the Ordinary High Water Level? What would be considered trespassing when the public seeks access to a body of water? This link will lead you to a new report from the Minnesota Department of Natural Resources titled Basic Water Laws. In question and answer format, this report will help you to understand the basics of water regulations in the state. Lakeshore property owners are reminded that removing aquatic plants or altering shoreline may require a permit from the Minnesota Department of Natural Resources (DNR). Additionally, Lakeshore owners who are considering projects that would alter their shoreline or lake bottom should review the DNR Division of Waters permit requirements before work begins. Certain types of alterations below the ordinary high water level of public waters or public waters wetlands require an individual Public Waters Work Permit.Click on this link for the full news release. Specific permit application information can be found on the permit information section of the MN DNR website via this link. Residents might assume that a product is sold in Minnesota meets the rules for the state. Sometimes that isn't the case, according to Capt. Ken Soring, DNR Northeast Region Enforcement supervisor. "We would rather have residents informed of the standards before they make the purchase, instead of having to tell them later that they need to remove a structure they already installed." Dock size, length and position is regulated to provide a balance between the protection and utilization of public waters. Extensive dock and lift systems may shade out important aquatic plants and eliminate critical habitat where fish spawn, feed, grow, and find shelter from predators. Lakeshore owners are encouraged to visit the DNR website at www.dnr.state.mn.us/regulations/boatwater/index.html for guidance on shoreline dock and lift structures. The DNR website also contains links to other helpful information for lakeshore owners about shoreline erosion control and restoration projects to help improve water quality and fish and wildlife habitat. Click here to download the Mn DNR brochure on Water Access Structures. Temporary Structure Permits are required whenever you want to place a structure or buoy on a lake or river in Hennepin County including, but not limited to swim rafts, designated swimming areas, mooring buoys, water ski jumps and ice skating rinks. Some permits are good for three years, and others must be renewed annually. Download the information and application packet here. The above links by permission and courtesy of the Hennepin County Sheriff Water Patrol. For more information please visit the water patrol website. To report illegal vehicular activity you should contact: Hennepin County Sheriff Water Patrol (612)596-9880, or West Hennepin Public Safety (763)479-0500. Click the blue text for a copy of the , in Adobe Acrobat Reader format (.pdf). Link to index of 2015 Hunting and trapping regulations or the 2016 MN Fishing Regulations , in Adobe Acrobat Reader format (.pdf). To report hunting or fishing violations call: DNR area Conservation Officer Officer Name: Brent Grewe Phone: (763) 205-6014, DNR Enforcement (651)582-1502, or orTIP (turn in poachers) toll free hotline 800-652-9093. Remember - Ice is never 100% safe! ICE IS NEVER 100% SAFE, Be prepared and know what to do in an emergency. The DNR recommends the following ice depths: 8 inches of new clear ice for small to medium sized cars, SUVs and pickup trucks, 5 inches for ATVs, and 4 inches for people. Winter sports enthusiasts can obtain a free packet of ice safety information, including a pamphlet and a minimum ice thickness wallet card by calling (651) 296-6157 in the Twin Cities area or toll-free 1-888-MINNDNR (646-6367). Computer users can send an e-mail to the DNR and ask for the free ice safety packet. Learn what to do if you fall through - Using Ice Picks for self rescue (Windows Media movie format file 4.6 MB, video courtesy of Minnesota Dept of Natural Resources). - Keep calm and think out a solution. - Don't run up to the hole. You'll probably break through and then there will be two victims. - Use some item on shore to throw or extend to the victim to pull them out of the water such as jumper cables or skis, or push a boat ahead of you. - If you can't rescue the victim immediately, call 911. It's amazing how many people carry cellphones. - Get medical assistance for the victim. People who are subjected to cold water immersion but seem fine after being rescued can suffer a potentially fatal condition called "after drop" that may occur when cold blood that is pooled in the body's extremities starts to circulate again as the victim starts to re-warm. - Try not to panic. Instead, remain calm and turn toward the direction you came from. - Place your hands and arms on the unbroken surface of the ice (here's where a set of ice picks or a couple of screw drivers would come in handy.) Work forward on the ice by kicking your feet. If the ice breaks, maintain your position and slide forward again. The best advice is don't put yourself into needless danger by venturing out too soon or too late in the season. No angler, no matter how much of a fishing enthusiast, would want to die for a crappie. For more information on ice safety contact the MN DNR and ask for our free ice safety publications, which include the brochures, "Danger, Thin Ice" and "Hypothermia the Cold Facts" and the wallet-sized reference card and 11X14 posters titled, "Minimum Recommended Ice Thicknesses." Metro (651) 296-6157 or toll free outside the metro area 1-888-646-6367 or email the Information Center at info@dnr.state.mn.us. 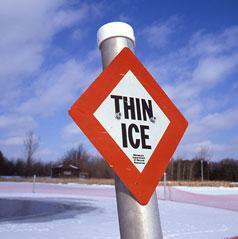 Ice safety information is also available by visiting the DNR Web site at www.mndnr.gov. Copyright © 2001-2019 Brad L. Spencer. All rights reserved. Photos are used by permission only, any use of images posted here must conform to the current published Use of Content Policy (see below). The following websites: lakesarah.com, lakesarah.org, lsia.org and lakesarah.net are neither owned nor operated by the Lake Sarah Improvement Association (L.S.I.A). The L.S.I.A. is therefore not responsible for this website's content. Opinions expressed on these sites are not neccessarily those of the L.S.I.A. or its board of directors. Links to this site are welcomed subject to the conditions as posted on the Linking & Use of Content Policy page. News and information are from sources that are thought to be reliable but no guarantee as to the accuracy of these items is implied.